Which are the best credit cards in India? Well, the choice of the best credit card depends on many things. The card that sound best for me may not be best for others. This is because of difference in features and scope such as joining fees, annual fees, discounts, cash back, where we spend, how much we spend and a lot of other things. One should remain cautious before accepting any credit card offer. Every credit card company is offering mouth-watering benefits like reward points, cash back, and other incentives. Many of us get attracted by these benefits and accept credit card without looking at basic features like annual fees, interest rate, etc. The credit card offer sounds lucrative at an initial stage, however, all these benefits get smashed when we receive actual credit card bill. Therefore, It is advisable to carry out independent online research before accepting credit card offer. You should be convinced that offer given by Credit Card Company is rewarding and will help you in saving money. In this post, I will share with some of the most popular credit cards in India. I will also help you to identify best credit card for your need. So, let’s begin our journey towards Best Credit Cards in India. A list of Best Credit Cards in India is given below. You can select the best credit card from above list as per your needs. Your payment habit is most important factor in the selection of credit card. If you are not on time payer you should select a card with low-interest rate else you can select any card. Get information about annual fees, the interest rate applicable and Interest-free grace period. Get information about overdraft limit and late payment charges applicable on a credit card. As per RBI mandate, all credit card company needs to publish MITC (Most Important Terms and Condition) mentioning information about charges applicable on a credit card. Before buying any credit card, one should go through MITS. Always choose a credit card that has excellent customer care support. Purchase credit card as per your need. Remember credit card can be a necessity but not luxury. Considering above points in mind I have divided best credit cards of India into seven parts. Starting from no annual fees to a premium credit card I will provide best credit cards in every category. So, let’s begin our journey to best credit cards in India. Note – All credit card review given here are unbiased (Neutral). I am no way associated with any of the company or do not promote any of them. Annual Fees are fees that you pay every year for the privilege of using a credit card. Most of bank and Credit Card Company offers a card with annual fees. However, few banks offer credit card with No Annual Fees. These type of card is also known as lifetime free credit card. Here are three Best Credit Card with No Annual Fees in India. First life time free credit card without any annual fee is Standard Chartered Platinum Reward Credit card. A special advantage of Standard Chartered Platinum Reward Credit card is this card provides a lucrative offer of 20% cashback per month on Uber rides. This means you can save sustainable amount on Uber ride per year. Additional benefits of this card are given below. Earn 5 reward points for every Rs.150 spend on dining outlets and on fuel. 20% discount for first time user of big basket. 1000 reward points on the first transaction of a credit card. Additional 500 reward points for registering online banking. On website it says joining fees of Rs. 250 but that will be waived off when you use your credit card within first 90 days. In order to get approval for the card you need to provide your income proof. No joining fees and multiple rewards with good saving is best part of this card. 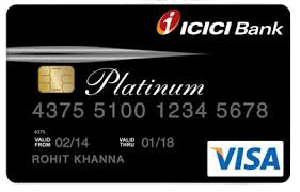 ICICI Platinum Chip credit card is life time free credit card. This card is claimed to be lifetime free card by ICICI. 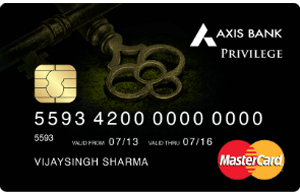 However, you need to Rs.50000 or above using this card to waive off annual fees. Features and benefit offered by this card are given below. 15% saving on dining bill. Earn 2 payback point on every Rs.100 spent. This card is generally issued against fixed deposit. The credit limit of card is decided based on amount invested in the fixed deposit. Approval rate of this card is not very good unless you apply against fixed deposit. Students, Housewife and Salaried people can apply for this card. 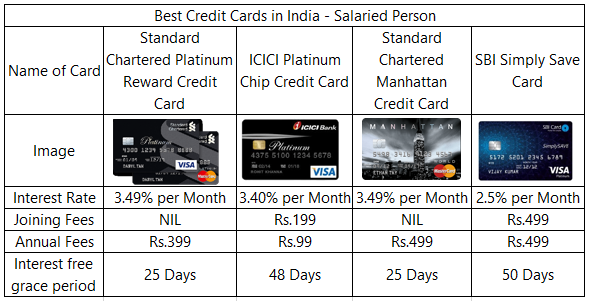 If we compare both Standard Chartered Platinum card with ICICI Platinum Chip card it is clear that Standard Chartered Platinum Card is a better choice. If you are the salaried person this section is for you. In this section, we will take a look at best credit cards for a salaried person in India. Standard Chartered Manhattan is the best credit card for the salaried person in India. This card comes with attractive rewards and cash back facility. You can claim 20% cashback on all UBER rides using this credit card. You can use Standard Chartered Manhattan Credit Card free of cost for the first year. 5% cash back at supermarket and department stores. You can earn up to Rs.500 as cash back every month and Rs.150 for each transaction. Renewal fee waiver if annual spend increase Rs.60000. 3X reward by using a credit card for a hotel, air ticket reservation, and fuel. This is the only card that offer 5% cashback on grocery purchase at almost all supermarket like big bazaar, metro, Reliance etc. The cashback part is most significant in this card. 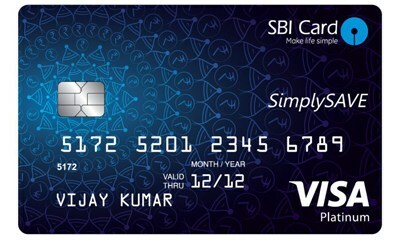 SBI Simply Save is a perfect card for the salaried individual. This card provides multiple benefits on shopping, travel, and lifestyle. Annual Charge of this card is very low. This card offers following benefits. 10X Reward points per Rs.100 spent on the departmental store, Grocery, Dining, and movies. Cash on the go facility. This card offers benefits on grocery, dining, movies, utility bill payment and fuel. All of these covers major part of household expense for the salaried people. Thus it is good to go for SBI Simply save card. If you are businessman this section is for you. In this section, we will take a look at best business credit cards in India. 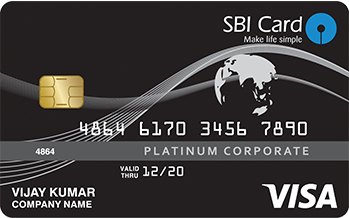 SBI Corporate Platinum Card is one of the best business credit cards in India. This card helps you to track your expense with spend management tool. You can set spending limit in order to ensure better control. This card is widely accepted in India and even at abroad. Spend Analysis and Spend Control. Travel & Fraud related insurance. Expense tracking and spend management to control expense is best part of this card. It is recommended card for SME. 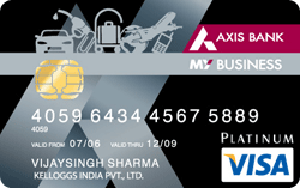 My Business Credit Card from Axis Bank is a second credit card in business card category. This card helps you to control your business and travel expense with unique business saving plan feature. It also offers you a free hotel stay for fix period. Additional benefits and features of this card are given below. This card is best suited for frequent traveler as it offers free stay at many locations. If you are fond of shopping you can surely go for following best credit card for online shopping in India. SBI Simply Click is the best credit card for the shopping. SBI Simply Click card provides benefits like login gift, e-shopping rewards etc. It is a card for a new generation that always remains online. Key features and benefits of this card are given below. You can earn e-shopping rewards for Amazon, Bookmyshow, clear trip and lot of other websites. You can avail e-voucher as milestone gift with online spending of 1 Lakh and above. Cash on the go facility of this card allows you to withdraw money from ATM. It is a contactless card. SBI Simply Click is generally given to salaried people. 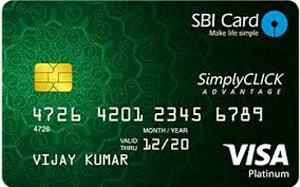 If you have SBI salary account you can easily get this card. 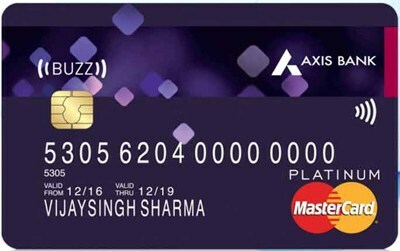 Axis Bank Buzz Credit card is ideal for online shopping geek. This card offers an exclusive benefit for shopping online. You need not pay any annual fees for the first year. Other exclusive benefits offered by this card is given below. If you are shopping geek and like shopping from flipkart you can think of using Axis Bank Buzz Credit card. 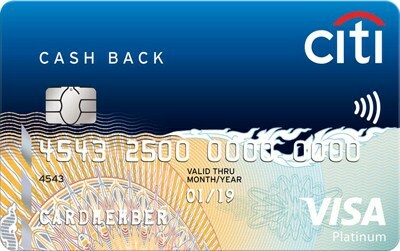 Citibank Cashback Credit Card is another best credit card for cash back in India. You can save a lot of money as cash back by using this credit card. This card gives you cash back on almost every transaction related to household including utility bill payment. Additional benefits of this card are given below. 5% cashback on Telephone and Utility bill payment. Up to 15% saving across participating restaurants. 75% Cashback on fuel purchase. 5% Cashback on all other spends. Cashback is auto credited in to account in multiple of Rs.500. You need good credit history in order to avail this card. Online process of getting this card is complex and time consuming. If you are frequent traveler following credit card will surely help you in order to save money on travel. It will also give you exclusive lifestyle benefit during travel. This card is claimed to be unlimited travel benefit card. This card offers multiple travel benefits to the customer including insurance benefit. The key features and benefit offered by this card are given below. Free Travel Insurance with benefits like accident cover, loss of baggage and travel documents. 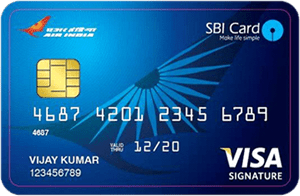 SBI Air India Signature Card is the second best credit card for travel. However, this is airline specific card. If you are Air India frequent traveler you should opt for this card. Additional benefits of this card are given below. 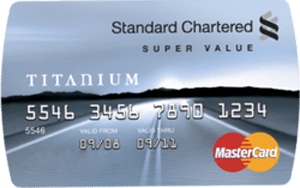 Standard Chartered Super Value Titanium Credit Card is the best choice for saving money on fuel and utility bills. Joining fee for this card is NIL and the annual fee is very low. Key features and benefit of this card are given below. 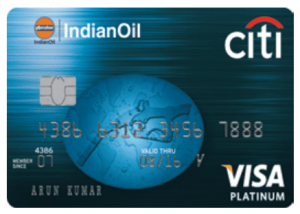 Indian Oil Citi Platinum Credit Card is Indian Oil specific card. In addition to fuel, this card allows you to earn on all other spends. Benefits of owning this card are given below. 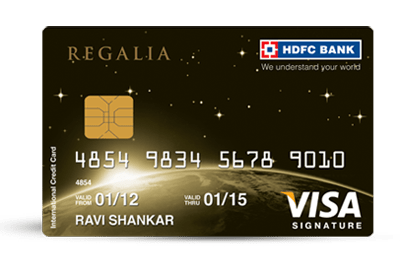 HDFC Regalia Credit Card is Best Premium Credit Card I have ever seen. This card offers world class privileges and saving opportunities. In addition to that, you can avail other complimentary benefits. Key features and benefit offered by HDFC Regalia Premium Credit card are given below. SBI Elite is one of the best premium credit cards. 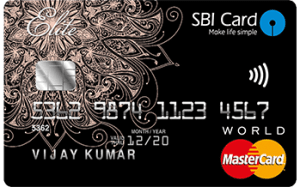 SBI Elite Card gives spend based milestone reward points that can be converted in to cash credit. Key features and benefits of this card are given below. 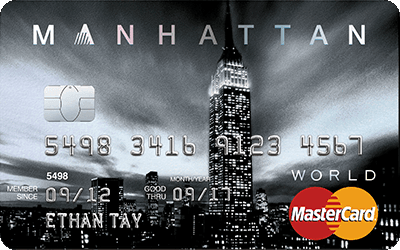 Standard Chartered Manhattan Credit Card is my favorite credit card. It is easy to get this card and it offers cashback on UBER rides and grocery purchases. Do you use any of the credit cards from above list?